Mike had been itching to run the section of the Calapooia above the upper section listed in Soggy Sneakers for a long time, so finally one weekend when everything was running medium high we headed up there. Mike had scouted the short gorge section in the summer and thought there might be a class V drop in there, so we were pretty excited about the possibilities. Most of the drops on the nine miles above 13 mile bridge can be scouted from the road. The first significant rapid is a long boulder garden about halfway up which is very similiar to Ricochet on the Upper North Santiam. Above this are two much tougher drops, both pretty much evenly spaced and bouldery. We stopped briefly and looked at the next boulder garden above 'Ricochet' and brushed it off as pretty straightforward, though once on the river we ended up scouting the whole thing because it was much bigger and pushier than it looked from the road. This one is located about 6.5 miles above 13 mile bridge. About a half mile above here we stopped when the river disappeared into a vertical walled gorge and got out to scout the big one. It wasn't class V, but it was still a pretty tough class IV drop with some powerful chutes and holes. Once on the river this one would be somewhat difficult to portage, so we scrambled down the very steep wall and scouted as best we could and decided that it looked really good. We put in just below a log jam about nine miles above 13 mile bridge and enjoyed the generally fast, splashy nature of the whitewater which provided a nice warmup for the main gorge two miles down. About a mile down from the put in the gradient starts to steepen and we encountered some really cool ledgy drops with some big boulders. Mike runs the small ledges above the gorge. Below here the gradient steepens considerably until the river takes a hard left and roars through the big one. We got out and I hiked down to rope Mike just in case, and a few minutes later he came down. He opted for the far left boof but the rock turned out to be sharp and it slowed him considerably and he kind of fell into the hole below it, which was backed up by another boulder. I could just see him getting tossed around up there in the entrance move and I started eyeing the hole at the bottom wondering if Mike was going to be doing an impromptu rodeo performance for me. Eventually Mike got out of the hole and got straightened out for the run down the main chute and ran it cleanly. My turn. I hiked back up out of the gorge and got into my boat and opted for a more center line. I eddied out on the right and then entered the rapid from the right, boofing a log and landing in the chute which was running perpendicular to my line. I too got pushed around a bit but got straightened out for the main run down the chute. Mike below the big one in the gorge. Below here we enjoyed some smaller drops until we got to the next boulder garden, which is unmistakable from upstream with a line of large boulders guarding the entrance moves. We entered on the right side, but there is an undercut there so boaters should scout. Below here the trip was pretty uneventful. Mike in the second boulder garden.. 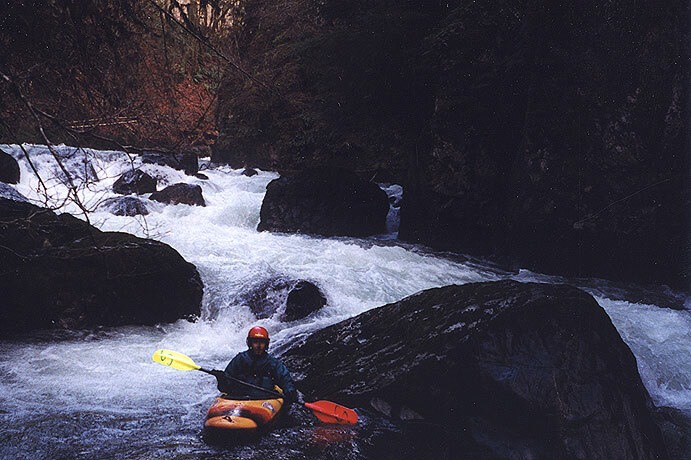 This uppermost section of the Calapooia contains the toughest and most technical whitewater the river has to offer. 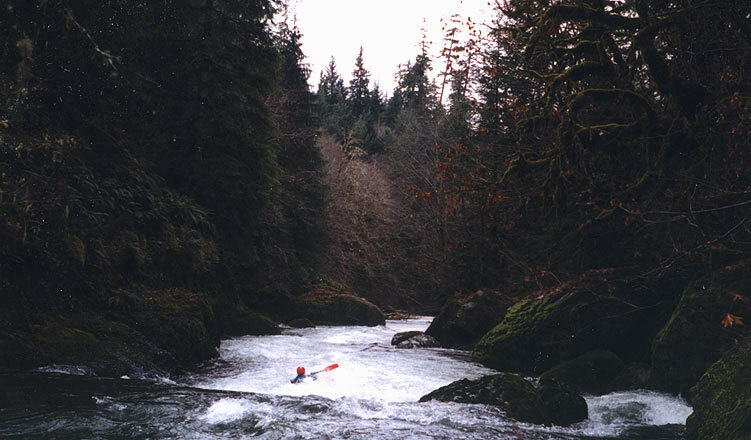 Though the run is class 3 overall, the three most difficult rapids would be very difficult to portage so paddlers need to come prepared to run at least one class 4 rapid. The road closely follows the river the whole way, making scouting possible on the drive up. The gradient numbers are deceptive- though the average is 65 fpm the section containing the short gorge is about 120 fpm for a mile. Always scout the boulder garden in the gorge before committing to it, preferably from the road because wood is almost always present in some of the chutes. Warm up at the put in because the river is quite continuous for the first two miles. Some interesting class III whitewater leads to the gorge, just over a mile downstream from the put in. Here the walls close in and the river takes a hard left and plunges through the biggest drop on the river. The hole at the bottom of the main chute isn't the problem; getting to it is the trickiest part. This jumble of boulders may be too shallow to run at lower flows. At higher flows the holes here could become quite challenging, though a sneak route may open on the right. Below this section the river opens up again and there are some more fun, smaller drops. At mile 2.3 the river once again squeezes through another interesting boulder garden. The entrance moves here require care- scout carefully for undercuts. The next five miles are easier but keep an eye out for logs and a few small but sticky ledge holes. At mile 7.5 there is a long boulder garden that is considerably easier with many more lines than the first two- this one is clearly visible from the road on the drive up. Class II water leads to the take out at the road bridge. Hazards: The boulder garden in the gorge should always be scouted- a log in the wrong spot here could be dangerous. This rapid can be scouted from the road eight miles above the take out. Look for the obvious steep walled gorge when the road bends to the left. At optimal flows this rapid is hardy class 4. Because of extensive logging in the area, boaters should be constantly alert for potential wood in the river. Access: Follow the directions to run number 86 in Soggy Sneakers. The bridge thirteen miles above Holley is the take out for this run. The put in is nine miles above here down a bank and through about 100 yards of mossy alders. As of December 1999 there was a small logjam just above the put in- this is visible from the road and very easy to portage on the far left if you decide to put in above it for a longer run. The 3.7 mile section above the put in can be run for a longer day. The river up there is quite narrow and is continuous/scenic class II-III with a gradient of 95 fpm. Gauge: None, but a convoluted correlation exists. 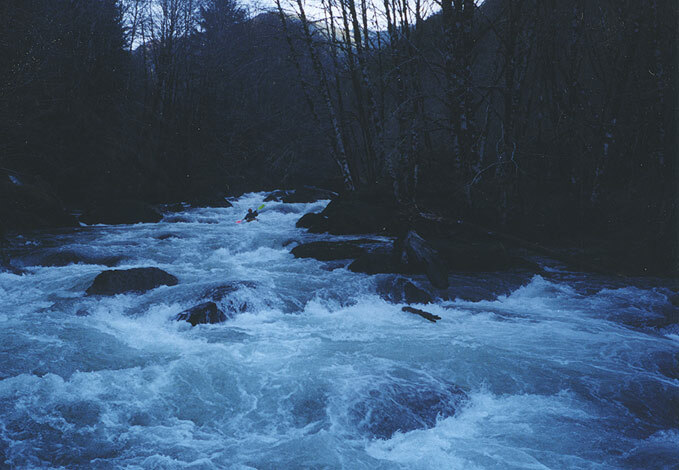 The day we ran it there was about 750 cfs and this was about optimal. That day the closest three rivers were running at: Blue River at Tidbits 1000 cfs, South Santiam at Cascadia 3000 cfs, Wiley Creek 3.7 feet or 700 cfs. (All data from Pat Welches Page) This section is good a day or two after a storm when other rivers in the area are medium high.